Prostate Cancer is the second most frequently diagnosed cancer. Even if the standard therapies for early-diagnosed prostate cancer (Surgery and Radiotherapy) have shown a high level of oncological efficacy, they are often associated with a high level of morbidity (in particular incontinence and impotence). For more than 2 decades, EDAP TMS has been committed to bringing a non-invasive alternative to prostate cancer patients with optimal efficacy and minimal side effects. HIFU (High Intensity Focused Ultrasound), jointly developed in the early 1990s by Inserm (French Institute of Medical Research), HCL (Lyon University Hospitals) and EDAP TMS, has been used routinely for more than 20 years throughout the world with more than 40,000 treatments performed on 3 generations of commercial devices: Ablatherm® Maxis (from 1993 to 2005), Ablatherm® Integrated Imaging (since 2005) and Focal One® (since 2013) to treat prostate cancer by creating a precise and irreversible coagulation necrosis of the targeted tissue while preserving the surrounding tissue. 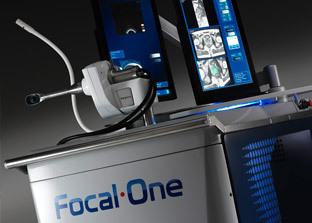 Focal One® brings the answer to all requirements for ideal focal therapy: accurate and MR-fused imaging, non-invasive surgical approach, precise and efficient therapeutic energy and end-of-treatment immediate validation with Contrast-Enhanced Ultrasound. 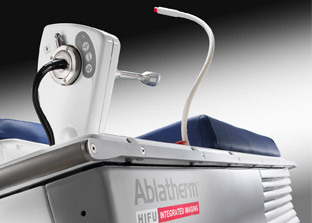 Ablatherm® HIFU is a fully robotic device (Robotic HIFU) with innovative features that guarantee optimal safety and efficiency for each treatment. This minimally-invasive technology causes few side effects and helps maintaining patient quality of life.